The Bureaus, Inc. is pleased to announce the selection of Vice President Marian Sangalang to speak at the Annual Consumer Financial Services Conference at the Loyola University Chicago School of Law. The two day conference, from May 31st– June 1st, was designed to address issues most common to financial services companies. 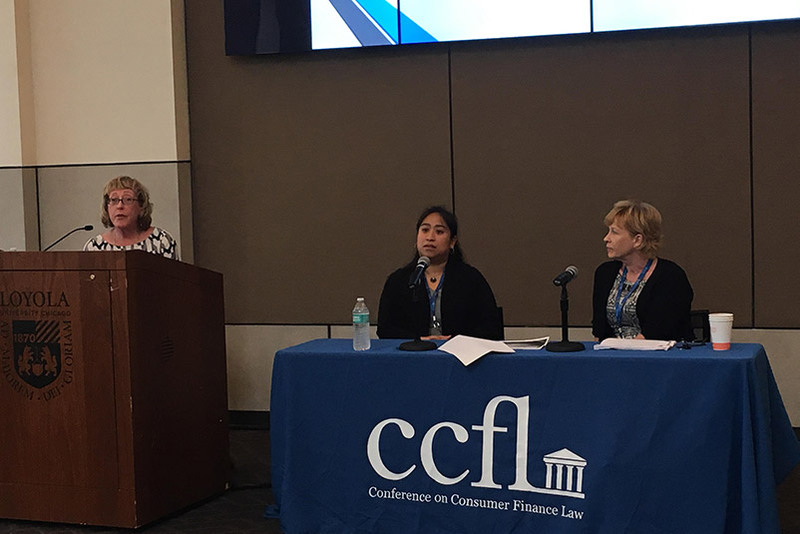 Some of the Conference topics addressed were: mortgage lending and services issues, fair lending, access to credit, debt collection and ethics, TCPA, MLA/SCRA, and cybersecurity. Along with co-presenter Kim Phan, Counsel at Wilmerhale, Mrs. Sangalang offered attendees the opportunity to learn about the significance and value of understanding cybersecurity and addressing the associated threats and opportunities. As the modern definition of security has extended far beyond the walls of our offices and buildings, companies are ever pressed to take pro-active measures to thwart cyber-attacks. The reputational and financial damages caused by data breaches, persistent threats, and misuse of information can be catastrophic to an organization. Marian Sangalang and Kim Phan presented on the importance of a comprehensive cybersecurity program. “Cybersecurity is a critical business investment and comprehensive programs must encompass the entire security process. From robust password procedures to stringent disposal protocols, organizations must establish vigorous internal cybersecurity policies and procedures,” says Marian Sangalang, Vice President of The Bureaus, Inc.
With legislative changes and privacy breaches, the pressures of mounting client expectations and regulatory demands exacerbate the need for increased attention and response to privacy and security. The Loyola University Chicago School of Law was founded in 1908 and is ranked as one of 2019’s top 75 law schools in the United States. Loyola has also been ranked 6th in the country for health law and 6th in trial advocacy (U.S. News & World Report). Loyola University Chicago has a highly ranked healthcare law specialty program and runs a variety of centers and institutes such as the Beazley Institute for Health Law and Policy and the Civitas ChildLaw Center. About Marian Sangalang and The Bureaus, Inc.
Marian Sangalang, Vice President at The Bureaus, Inc., is a Master Servicer and Certified Receivables Compliance Professional (CRCP). She has pioneered many popular industry software suites and works closely with developers to optimize the products for business use. Always on the forefront of technology, Mrs. Sangalang assists in the development of proprietary tools including account level net present value modeling and data management systems. She was elected to the RMA International Board of Directors in February 2015 and currently serves as President Elect for RMA International. Founded in 1928, The Bureaus, Inc. is located in Northbrook, Illinois.